TCam-2 cells are the main in vitro model for investigations into seminomatous tumors. However, despite their widespread use, questions remain regarding the cells’ homogeneity and consequently how representative they are of seminomas. We assess the TCam-2 cell line using routine and novel authentication methods to determine its homogeneity, identify any cellular sub-populations and resolve whether any changes could be due to generational differentiation. TCam-2, embryonal carcinoma cells (2102EP) and breast cancer cell (MCF7) lines were assessed using qRT-PCR, immunocytochemistry, flow cytometry and short tandem repeat analyses. Raman maps of individual cells (minimum of 10) and single scan spectra from 200 cells per culture were obtained. TCam-2s displayed the characteristic marker gene expression pattern for seminoma, were uniform in size and granularity and short tandem repeat analysis showed no contamination. However, based only on physical parameters, flowcytometry was unable to differentiate between TCam-2 and 2102EPs. Raman maps of TCam-2s comprised three equally distributed, distinct spectral patterns displaying large intercellular single spectral variation. All other cells showed little variation. Principal component, cluster and local spectral angle analyses indicated that the TCam-2s contained two different types of cells, one of which comprised two subgroups and was similar to some 2102EP cells. Protein expression corroborated the presence of different cells and generational differences. The detailed characterization provided by the Raman spectra, augmented by the routine methods, provide substantiation to the long-held suspicion that TCam-2 are not homogeneous but comprise differing cell populations, one of which may be embryonal carcinoma in origin. The online version of this article (doi: 10.1007/s00441-013-1684-9) contains supplementary material, which is available to authorized users. 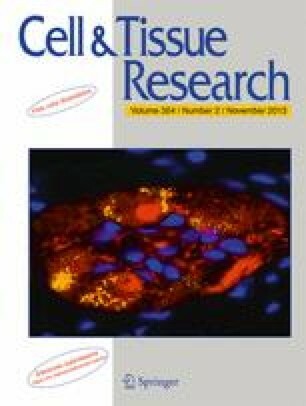 The authors would like to express their gratitude to Professor Hubert Schorle of the Department of Developmental Pathology, University of Bonn for the TCam-2 and 2102EP cells and his critical reading of the manuscript and Ms Reinhild Sandhowe, Ms Riham Faroun and Ms Anne Bachg for their technical assistance. Eppelmann U. performed part of the Raman analyses and contributed to the writing of the manuscript; Gottardo F. performed part of the Raman analyses and contributed to the writing of the manuscript; Wistuba J. interpreted the results and contributed to the writing of the manuscript; Ehmcke J. performed the immunocytochemical analyses, interpreted the results and contributed to the corresponding section of the manuscript; Kossack N. oversaw the qRTPCR analyses, interpreted the results and contributed to the corresponding section of the manuscript; Westernströer B. performed the qRTPCR analyses and contributed to the corresponding section of the manuscript; Redmann K. performed the flowcytometric analyses, interpreted the results and contributed to the corresponding section of the manuscript; Wübbeling F. performed the mathematical analyses, interpreted the results and contributed to the corresponding section of the manuscript; Burger M. performed the mathematical analyses, interpreted the results and contributed to the corresponding section of the manuscript; Tüttelmann F. oversaw the short tandem repeat/variable number of tandem repeats analysis, interpreted the results and contributed to the corresponding section of the manuscript; Kliesch S. interpreted the results and review of the manuscript; Mallidis C. performed part of the Raman analyses, designed and oversaw the study, interpreted the results and wrote the manuscript.